First all thanks, Dee Dee for recommending this manga to me! I really enjoyed this first volume. Ninako was a bit of an idiot sometimes, but I really grew to like her in this volume. I am really happy that she had the heart and guts to reject the guy who asked her out. I have read enough books/manga were that doesn't happen, so yeah for this one! Ah Ren, Ren, Ren. Damn he was beautiful and yummy. Ok, so are a lot of the guys in the manga (if you see them), but Ren just tops them all. He is dark, mysterious and sweet. Daichi, ugh I didn't particularly like him. I found him about to pushy and annoying. 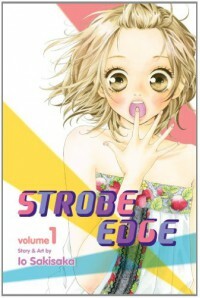 But in overall, this was a fun manga, and I might check out the rest of the volumes!